TubeNet • View topic - DILLON DBB-1284 ? Anyone played it? Looks like a hybrid of a GR51 (bore), 191 (bell) and something else (4th valve wrap, American-ish)? The Dillon DBB-1284 is a 6/4 sized BBb tuba much bigger than the GR51 or even GR55. Think 6/4 Nirschl CC bell and bottom bow put to an in-tune BBb tuba priced for the Average Joe to enjoy. Mark is correct that I'll have one (plus an extra) there at the 2019 Army Tuba-Euphonium Workshop. Thank you Matt for your input. Agree with bort, a straight on photo of the front would help. Also any side by side with a horn we're all familiar with might help as well. How long has this been out? Another question for Matt: the listing on your site says it takes an American shank mouthpiece. Are we talking the smaller Bach/Conn Helleberg type shank? If so, why this choice vs. the more common/modern European size shank? I just went through this with an older East German horn, and while it's manageable, It's kind of a hassle and limits your choices. Why do you think the European shank is more common in America? 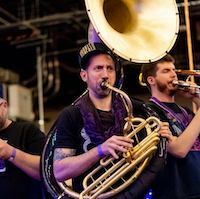 A lot of questions about this new DBB-1284 tuba. Keep in mind that my goal in finding this tuba is to get an adult community band player a modestly priced, easy playing big BBb tuba that gives the sound of the very expensive 6/4 CC tubas. The TubeNet Community is full of a lot of people offering suggestions on how something should have been done instead. It reminds me of the Car Magazines that universally say something like: "Gee, if they just put an extra 100 horsepower and 20% more torque in the engine, more expensive and fatter rims/tires, tweak the suspension, use better quality interior materials, extend the wheelbase, change out all the sheet metal for a lower sleeker look so that only smaller athletes can climb in, and add more electronic gizmos, they'd have a winner in this mid-priced sedan." 1) About the pictures. They are taken on an iPad dialed into our website etc. Don't ask me computer stuff. Anyway, we don't have the space to set up a studio just for tubas to stand on the bell. Remember we sell hundreds of other stuff to each one tuba so while everything else can stand up and trombones lay down in the limited white area we can spare for photos, tubas have to lay down. Because of the bell, tubas won't lay down flat, Jake tries to make the pictures show as much detail as he can. I'm not a photographer so that is my limited knowledge understanding. Take a look at the third photo that shows the tuba from behind to get a good profile of the bell. 2) This tuba is the same size as the 6/4 York style CC tubas. So it's even a little fatter in the throat than a MW Fafner BBb tuba. 3) Bore size is smaller than a Fafner or the other big European Rotor BBb tubas. That means the blow style is more like the .750" bore piston 6/4 CC tubas. You just lay back and take it easy with slower air in the low register for best results. You won't have to blow chunks of lung through it just to get a full sound. If you try that, the horn will feel stuffy. 4) Standard American shank receiver seems to work just fine on this horn. The average adult community band player plays a standard American shank receiver mouthpiece like a Bach or Conn. If you own a larger Euro shank mouthpiece, give it a try. You might like the way this horn plays on what you already have. 5) 4 rotors on a BBb tuba are enough for the majority of adult community band players. Lacquer is cheaper and looks nicer longer with less work for an adult community band player who has other things to do with his/her spare time. Not everyone wants an to spend extra money for an extra couple pounds of seldom if ever used brass (5th rotor assembly) on their lap. 6) Pro and semi-pro CC players that want to add a modestly priced big BBb tuba to the arsenal for something that is only going to get occasional use, will also love this tuba. Anyone looking for a really big, great sounding, 4 valve BBb tuba that is surprisingly easy and fun to play and is within the budget of an Average Joe, should give this tuba a play. No one tuba is perfect for every player. That is a great looking horn! I'd love to take that thing for a test drive... but being hundreds of miles away, sadly, that will probably never happen. Agreed, I am even downsizing to 3 valves myself because 99% of all concert band music never requires Pedal D, Db, & C in their literature, and if you have a good enough ear you should be able to lip something a few cents up or down once the horn is warmed up anyway. (Plus just hate lugging a 21+ lb horn around anymore). I'm glad to see a rise in larger BBb horns either way, thanks for catering to this segment of players. Thanks Matt. Always appreciate the directness of your responses. Will a CC version be coming next year? I played this tuba a while ago when Matt put it in my hands while he was cleaning my euph. If I hadn’t bought my Hagen 5/4, I would consIder this tuba. The valve stroke seemed a little on the long side for a rotor tuba, and Matt said it could use a linkage/miniball upgrade, but other than that, he's got a real winner that I would not hesitate to recommend to a school or student. I spent a good amount of time on one at the conference and was quite pleased with the sound. All in all, it was also quite easy to play. My only suggestion to Matt was that the valves are a bit slow. He mentioned different springs would help. Otherwise, it’s a great deal! They have about 4 on hand in their store that I stopped into play. What a great amount of horn for the money. It's definitely a 6/4 but its wrapped very tight so it's a lot easier to hold than most. If you are looking for a dark rotor 6/4 that you want to sound great on....try it out. I stopped in to try the big Martin but spent more time on one of these. lost wrote: I stopped in to try the big Martin but spent more time on one of these. Oh come on... We need more than that. You can't stop there! Tell us more, pretty please. I was at Dillon's today. I didn't play this horn, but some other guy in the room did. He noodled on it for 5 minutes then asked Matt to pack it up and paid cash for it right then and there. Don't know if that anecdote was helpful, but that's all I got. And I bet that Matt will modify and hot-rod this thing with better springs and minibal linkage so you can have yourself a winning mid-priced sedan! For a price, of course.